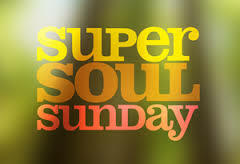 I love the Oprah Super Soul Sunday series. It’s my church service. It lifts me up and beckons me to be all that I was born to be. She is a bright shining star in my life as I know she is in many. And she has helped so many other stars to shine their light in the world. Collectively her and her guests shine as bright as the sun. The older I get, the less I feel “I know for sure”. Living in the question has become my mantra. My guiding light. My insight into myself. My insight into the world of others. Living in the question has made me a better listener. A better friend. A super mom. A truly attentive wife. But…when I think about it, there are a few things I know. For me. For sure. So here’s the lists. A list I will probably expand on in later posts. Be the Change – we all want to change the world but wanting is not enough. We must first become it. 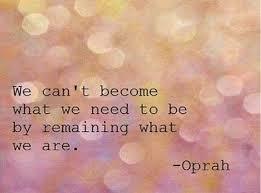 No change comes until we encompass it fully ourselves. Want a peaceful world? Become peaceful yourself. We ARE what we THINK about – When I think negatively, negative things, people and situations show up. When I think positively, the world is my oyster. Get the Mind QUIET – Meditation is perfect for this. But so is a walk in nature. Wondering at the stars on a clear night. A beautiful piece of music. Playing with a pet. Forgive – Myself first, then others – Negative self talk is a destroyer, not only of myself but of those around me. When I forgive myself I see my humanness which in turn helps me to see the humanness of others. When I forgive myself for being human I’m in a much better position to understand that others are also human. Forgive myself. Forgive them. That’s how it works. Accept what IS, Right here, Right now –This was a hard one for me but has gotten easier over the years. What is – IS – what is. Resisting what IS only brings suffering. Accepting what IS opens up a world of choice. And resolution. Make Fear, Anger, Resentment – your Friend, not your Enemy – When we try to run away from our fear, resentment or any other negative emotion, we are resisting it. When we can allow it quietly, without judgment, when we can say – “oh fear, here you are again. What have you got to say today?” it’s message is revealed. It then has freedom to communicate our blocks or a deep seeded beliefs that need rooting out. When we’re not afraid of the negative, we allow it, we shine light on it. It only wants to be heard. It CANNOT survive the bright light of your nonjudgmental self. Negativity is an illusion of the mind and when we can visit with it, it vaporizes into nothingness. Be Grateful! No matter what, find something -ANYTHING – to be grateful for in each and every moment. Don’t delay this. Gratitude is the magic wand in our lives. When we are grateful for what we have, we get more of what we want. When we live in a lack mentality, we get lack…everywhere. Even if all you can find is that you can take a breath right now, it’s a start. GIVE everything away – Your love, your confidence, your gratitude, your quietness, your forgiveness and yes your stuff. Maybe not all of your stuff but a good bit of it. It always comes back. Always. EVERYTHING is transient – Change is happening in every moment. Get okay with this and resistance falls away and love steps in. So does acceptance. So, I guess I know more than I thought. But living in the question is powerful. Living in the question brought me to what I DO know for sure. Thank you Oprah for shining your light in the world. Thank you for sharing other lights with us. Thanks for reflecting my light back to me. Wow. Just wow. I’m back. . .
It’s been a whole year since I’ve posted here. What have I been doing? Well. . .
Been busy too – with things. . . Exciting things. Boring things. Spiritual things. Kid things. Sad things. Parent things. Creative things. My writing career – Got published in several magazines. Started writing a blog for a wonderful company called Chocology. Organized a conference for my Texas Unschoolers Group in which 200 fabulous men, women and children attended! Spent lots of quality time with my family and friends. Lost a step-mother in law. Got more intentional about who I spend time with. Just life stuff. And death. And trying to figure it all out. The blog is something that is just mine. A place where I can share when I want – without dead lines or expectations or agendas. Kind of a public journal. Something close to my heart. Something I edit – but not too much. I think I’m back. At least for RIGHT NOW, I’m back. Don’t really know if it’s for good or just for this post. I HAVE committed to writing. I do it . . .Every. Single. Day. – without fail. Yep. Get up extra early (aka before anyone else), Sit at the computer no matter what. Close email and Facebook. Look at the blank screen.Allow something to come. Or nothing. But I do show up. Still trying to figure out where to put it all – Here – There – Everywhere? For now, it’s here. Tomorrow it may be over there. Eventually, if I keep going, it will be everywhere. One day at a time. One step at a time. One moment at a time. So, hello again. So glad to be back to the blog and to all of my friends here. I would love to hear about you and what you’ve been up to. A lot happens in a year. I’m all ears. You are currently viewing the archives for June, 2014 at Michelle Conaway.